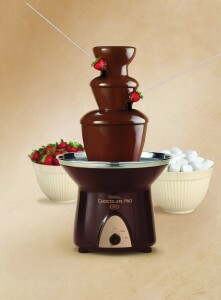 So, you’ve decided that you want the best chocolate fondue fountain. Before you make a purchase, there are some things you need to know. It’s easy to understand why many people have never heard of a chocolate fountain – it’s not exactly something you see every day. However, that doesn’t mean that it’s any less extraordinary. 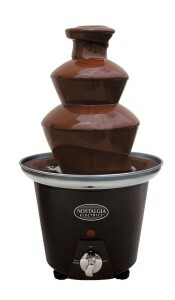 This type of fountain is used to serve a tasty treat called chocolate fondue. It has a basin at the bottom, which keeps the chocolate in a liquid state. The chocolate must be pulled into the center cylinder, and eventually, it’s sent vertically into the top portion of the fountain. The end result is somewhat of a waterfall of liquid chocolate – something that most people find hard to resist. As the liquid goodness flows over the fountain’s tiers, guests can dip marshmallows, strawberries or other treats in it to satisfy their taste buds. There are two major types of fountains – commercial and home. The commercial-grade can be up to 50” tall, and it’s normally used in professional environments and for catering. A typical commercial fountain might have as much as 35 LBS of chocolate in it. The type that you probably want is meant to be used in your home, and it will probably be about 19” tall. The home variety is usually made from plastic and can be built with some stainless-steel components. However, there are many full stainless-steel models, which are higher-quality than their plastic counterparts. To start with and for a very long time, fondue fountains will only available for commercial applications, which means they weren’t created to be used by your typical consumer. Some companies started making them in 2004, and soon after, the popularity for these fountains increased dramatically. How Are These Fountains Used? Maybe you’re wondering how a chocolate fountain is used. Put simply, you can use it for anything you want. It can be used for a catering event, birthday, wedding or banquet. Regardless of your plans, guests will definitely be amazed by this beautiful, tasteful product. You might imagine that such a product would be very hard to clean, but it’s actually a very easy process. In most cases, the fountain can be completely disassembled and cleaned with a dishwasher. However, it needs to be thoroughly dried. The base is the only part that might require some manual cleaning. You will be pleased to find out how easy it is to assemble the fountain. What Kind Of Chocolate Does It Need? You have to understand that this product requires a special blend of chocolate. For example, you can’t exactly throw a few Hershey’s bars into it. You can use almost any type of couverture chocolate, which has 33 to 44% cocoa butter. There is a good chance that you’ve never heard of this type of chocolate before. It’s basically a blend that has a higher amount of cocoa butter than your typical products, which is needed to ensure the products stays in a liquid form while flowing. The name of this blend is actually French for the word ‘covering’, and it’s a blend that is usually used to coat truffles and other types of candy. After purchasing the fountain, you’re probably excited about getting it up and running. However, the low temperature of the product will have you waiting a very long time for your solid product to melt, so it’s a good idea to use a double-boiler to melt the chocolate before pouring it into the fountain. It’s very important to make sure that you never spill water into the chocolate because this will spoil the finished product. If you have plenty of time to spare and plan ahead, you can certainly just place the solid product into the fountain and let it do the melting. If you melted the product correctly, then it should not be too hot or cold. It will also have a very alluring shine to it. Thickness is very important because the product needs to be able to flow properly. The thickness needs to be just right. Some people worry that the chocolate in a fountain will eventually harden, but since there is a heating element involved, it will never harden. A typical fountain can serve as many as 50 people. There are larger models that can easily serve 250 guests, and if chocolate is added continually, there is no limit to how many guests it can serve. Cookies, pretzels and fresh fruit are some of the dipping favorites. 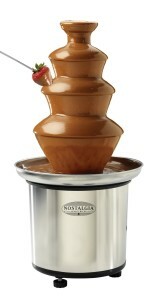 If you don’t already own a chocolate fondue fountain, then you have no idea what you’re missing out on. To be honest, this was one of favorite articles because these machines are really something else – in a good way. If you’re looking for the best chocolate fondue fountain, then you’ve come to the right place. We’ve done all of the research and created this top-three list, so all you need to do is pick from one of the three products below. It was really tough choosing just one ‘best’ product. However, we eventually went with this mode. It’s the Nostalgia Electrics CFF986 3-Tier, and there is no shortage of reasons why this model took the top spot. Let’s dive right into it – not literally. Unlike some of the smaller models, this is a 3-tier fountain. We’re not a huge fan of the fact that the tiers are made of plastic, but the stainless-steel base really helps to make up for it. This particular model will hold about two pounds of chocolate, which is plenty for most occasions. It’s an auger style fountain, so it doesn’t require a pump. On the back of the unit, there are motor and heat control buttons. You know it’s safe because it’s been built to the North American Electrical Standards. It doesn’t require expensive chocolate chips, but you can certainly use them. Out of the Nostalgia line of products, this is easily the best one. It’s perfect for most occasions, and for the price, you can’t beat it. However, you do need to understand the difference between compounds for fondue fountains and regular chocolate, which you can find here on this page. There really is no better way to impress guests. What could be better than a cascading fountain of chocolate goodness? You can get more info here. After careful consideration, we decided the Nostalgia Electrics CFF965 Mini Chocolate Fondue Fountain was worthy of the second spot on this list. However, you should keep in mind that it’s a mini-fountain, so it’s quite a bit smaller than you might expect. It’s extremely inexpensive, so you should have no trouble pulling the trigger on this one. At the time of writing this review, this model is the #1. Unlike the #1 choice, this model has a 2-tier tower, which is made of plastic. It has an auger-style operation. It can hold up to 1.5 pounds of melted, creamy goodness (chocolate). Since it’s an auger-style fountain, it does NOT use a pump. There is a single motor control and heat knob. It has been constructed to meet the North American Electrical Standards, so you shouldn’t have to worry about it catching on fire or something. You should think of this model as a lesser version of the #1 choice. Although it’s smaller with only 2-tiers, it should have no problem exciting guests; use it at any special event you can think of. Cookies, pretzels, marshmallows and strawberries are perfect for dipping. Cleanup for this product isn’t super easy, but it’s not horrible, either. Place a plastic tablecloth around the base to make cleanup even easier. Go ahead and see more info here. If you were looking for something elegant, then you should be interested in our third choice, the Wilton 2104-9008 Chocolate Pro. It’s a bit pricier than the second pick, but it’s certainly worth the extra money, and we’ll tell you why. One of its best features is the three tiers. You get THAT much more dipping space with the additional third tier. It has a larger capacity than our #1 and #2 picks, with the ability to hold just about 4 pounds of chocolate, which must be melted. It’s important to remember that the chocolate is sold separately. You can adjust the bubble level and feet, which makes it operate fantastically well on counter and tabletops. It has removable parts so cleaning is very easy. It’s made for indoor use. Although this thing is amazingly fun to look at, it’s even more fun to dip bananas, strawberries and other treats inside of it. A lot of consumers think that these fondue fountains are novelty items, and that isn’t the case at all. They’re wonderful kitchen appliances, and our third pick is no exception. For the price, you get a product that is comparable to our #1 choice. You can get more information here.